Live the Life you Want <3: Weekends just Shake By! So This past weekend, I was with my awesome friends. 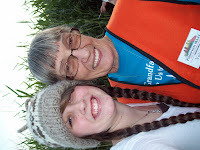 Like on friday, we went to a corn maze. As a group, we go every year. But these days, its getting smaller and smaller. So we wanted a group discount. So we went around to people who didn't have the wristbands on and asked them to join our group. Apparently they thought we were crazy because all of them said that their group is coming soon.. what a coincident! So we gave up and gave in to buying our own tickets. I wanted the orange wristband because I could go into the Haunted House, which is practically the only reason I go. But they all said that I had to take the green. It was terrible. I felt so useless! Haha But it was fun. 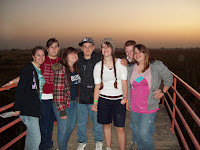 We walked Around in the corn maze. There were inside jokes made and major randomness. It was fun bringing up old times. And everything. Like my friends, Jeanette and Katlynn all got to hang out and have nothing stopping us. Some were party poopers. Some we Love-Dovey. But thats life. Its going to happen to everybody. Eveyone is going to talk about it. Life goes on. So After the maze, Most of the group went into the Haunted House. Katlynn and I stayed out of it some of chioce and some of Force! Gr. 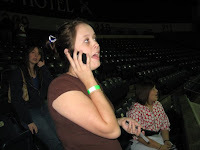 But I had my friend Jeanette call me through out the whole H.H. and She thought it was too scary to tell me so she handed it to Heather. She would give me eery detail and everything, when to turn and everything. It was actually ammusing. Once they came out, some were laughing, some were really sad. It was totally cool, except for the sad one. Heather said that IT was there and I didn't get it but then... BOO! I was running and screaming and went over to Hollee and just sat there while she held me. I HATE the movie IT. Its sooo scary! Yuck! But then I laughed at myself and said that I wanted a picture with it... Ha. It was so much fun though. And as my mother suspected, as well as everyone else, I had a seizure. I started seeing these "red Dots" (view previous blog post) and they laid me down on the hay. And I woke up to this. He didn't want to smile, but I asked him too. Anyway, He was a paramedic off duty. And even better. His family owns the corn maze! Gasp! It was pretty funny. But he told me that after I have one that I should bend my legs upwards for the blood flow would go to my head. Also to drink warm water instead of cold because it is like a swimmers dive... It could cause another seizure instantly. But yes. 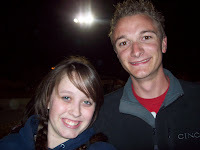 He was my hero that night. So That Was a HOOT! No pictures of this even but I've got memories. So I was at my school for the snack bar supporting my Speech and Debate Team. I also needed credits but I was enjoying whatever I could. In the bar was My mom, Mrs. Bonaparte, and I. It was so much fun. We would be busy, then not, continuously. My team-mate Jeremy, would always come and chat when we are both free. Let me tell you. Jeremy has had past of duo partners. It seems that he can't be friends with any of them afterwards, so we both said that we wouldn't be eachothers partner. But we know we would because we are cool like that. Anyway. It was alot of fun. I saw my old/new competiters. Like I got to talk to my friend John. He is really nice and funny so we automatically had no problem talking, he wouldn't go either, even when I was still working. Mom and ... well I'll just call her Katie,.. both said that he put out an effort to talk to me. I didn't believe it, now I do! So yeah I started to not feel good, turning pale, and everything, It was very sad. So I went over to one fo the benches and slept on them for bout 30 min. I wasnted to se the HI's and so I freaked out when I saw the time. 'I SLEPT THROUGH IT!' is what I thought. so I rush over to the room. It was empty. So sad. So then I give up waiting and went back into the cafeteria and hung out with Jeremy. Previously, John was suppose to tell me when the HI round starts. I was very mad. haha So when I saw him "Why didn't you tell me" John: "It hasn't started yet." Silly me. So I told him to text me and tell me what he placed because he thought he would be in last (Actually 6th out of 7). But Later that Night was a hockey game. Not just a normal hockey game. THE "First Game of the Season" Hockey Game! So We got there. It was fun. Tessa, Heather, Leah and I were already there and I had to help a friend of their, Jason, Get there. He gets lost so easily. I partially blame myself because I'm not that great of a direction-er. I dont. So I gave the phone to this guy who did.He eventually came and My goodness it was forever because I had to wait for him. He thought I was Heather apparently. SO not the first time to hear that one. But he came and I walked him up to our seats and he sat by me. He was quiet and I couldn't stand it. Whoever knows me, knows thats a problem. So we just sat there, totally boring in my section, which is not cool by the way, and just sat there. 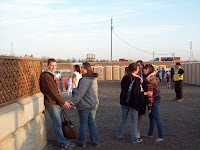 Then my friend Tricia, her BF Jimmie, Jeanette, and her friend. Tricia brought me a boque of Red Roses bc she didn't go to the Corn Maze so she bribed me to forgive her. It worked! So We got to hang out and everything. It was alot of fun. We had to move sooo Many times. We all wanted to sit together and the place started to fill up. Making sacrifices was a huge thing that night. So the rest of the group came. Hixsons, Jensens, Jensons, haha came. It got really busy. Hot. Loud. Dotty..OOPS! Good sign. So I got up and tried to get out of that long row of people. As soon as I got up, Tricia got up right with me. Nobody else came. No one. She took me as far as I could go.. which was coincedently behine the non-playing hockey players. I had a Seizure. Oh LUCKY ME! I woke up with the paramedics, my mom, and IV in front of me and a oxygen mask on. I started laughing. It was funny.. to a point. I scared Tricia half-to-death! That was mean of me. :[ but I move on, got to. So Eventually I moved and everything. I sit up to one of the hockey players looking at me. The they get me a wheelchair. Once I'm up, that one player, nudged 5 other players and nodded my way! How rude. I wanted m privacy. Just Kidding. It was fun. I waved to them. Told to them to watch the game. Gave them the "Peace" sign. It was really funny. Eventually we went downstairs and when to the First Aid room. Practically where the paramedic chill. And we just sat there while mom was getting the Car. So The one paramedic that wasn't holding the IV was one that I already met prviously... at another incident.. with a seizure. Well we actually don't know what that was but he was there. But his name name is John and he said that I was his first medical emergancy he had there. I felt so honored! We told eachothers story to the other guy. We'll call him Mario. So then John left to check on something and Mario and I just chilled in there talking about what I'm going to eat since I was sooo hungry. We decided Taco Bell. I had an Awesome time. I even had fun with paramedics! It sounds like you have been busy. 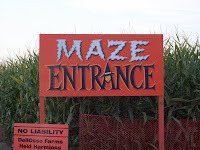 I always loved going to corn mazes with a bunch of friends. 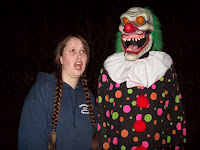 I only went to a Haunted house once- I almost peed my pants so i don't plan to ever go again. I liked your last line the best. Your attitude is inspiring. Sounds like to me your doing this to meet all the cute parametic guys. Just Kidding. We love you.